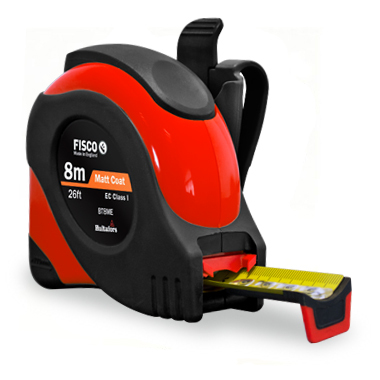 An advanced measuring tape with a multitude of user benefits, designed for measuring more quickly, easily and reliably. The tough, rubber protected case houses a blade which is accurate to EC Class I, offering the end-user the highest level of measuring accuracy available. Tough rubber protected case with patented shock absorber, designed to survive heavy on-site use. Ergonomic case shape makes the tape easy to handle during use. Superior brake control with maximum holding power. Clear-view end-hook allowing the blade to be read right up to the tip. Rubber grip tips locates and holds the blade tip firmly when hooking on. Easy 100mm inside measurement make add-ons easy (5m model has flip-out arm).